We woke up this morning with the gospel story fresh in our hearts and minds. The disciples found the empty tomb two thousand years ago today, but this wondrous morning came after a somber full day of not knowing what the future held for Jesus’ followers, they didn’t know what tomorrow bring and today little Bella is in a similar situation. She has been here for a few months and even had her surgery, but the pulmonary artery is slightly narrow which is a result of the surgery. 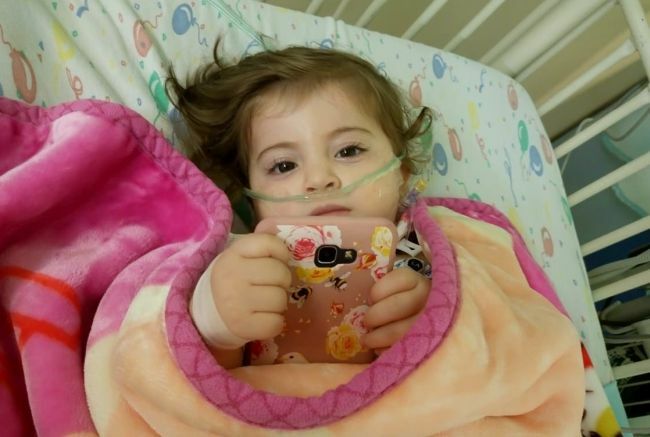 This changes the pressure in the heart, which is risky because the type of care she would need in Kurdistan remains undetermined. Her echo today will be discussed tomorrow by the doctors, if they need to, they will do another catheterization; so please, friends, we’ve seen miraculous healing before, we’ve seen fluid clear and holes disappear from the heart, so we ask your intercession on behalf of sweet Bella, for faith in the Lord for her mother, because when we can not see the road ahead He knows the future, and for strength for mother and daughter in the waiting. Today , Bella had a CT scan in the hospital. Her appointment was early in the morning at 8 o’clock. 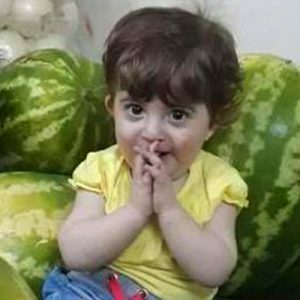 She was fasting, because of the procedure. 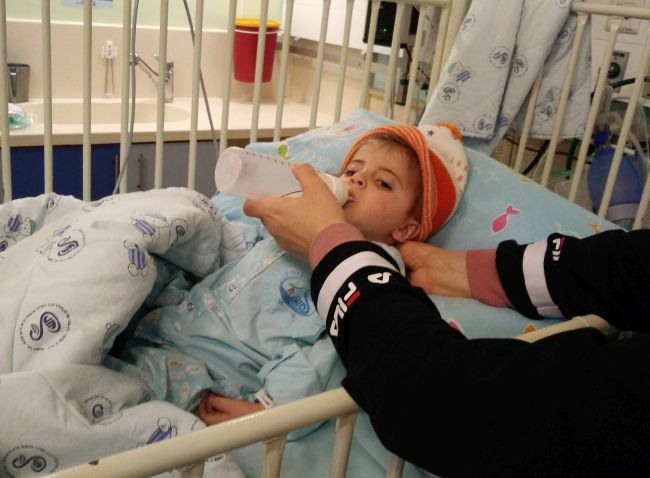 After the intervention, she was finally able to eat and drink again. Of course this improved her mood and we had a good time together despite the long wait. She is such a lovely girl. We are waiting now for the results. Please continue to pray for Bella. With no sign of fever, and Bella happily playing, chatting and generally being her normal lovely self yesterday, Bella’s mum said to me she didn’t think Bella was quite right. We tried to unpack her symptoms together and felt that maybe her recent change in milk had been the culprit of Bella’s poorly tummy although mum persisted in thinking this was unlikely. We tried to get Bella to drink some rehydration formula, to which she protested with great disgust, which mum had predicted might be the case. She knew this because she knows Bella very very well. Mums almost always know best when it comes to their child so this morning after a challenging 24 hours for Bella and her mum we took Bella to the Emergency Room at the same time as Noora. God blessed our time in the ER with both poorly children. Despite the circumstances there was a lot of joy had during the time. 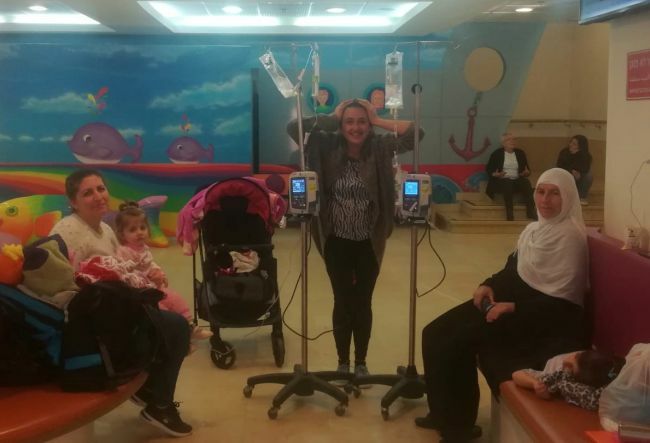 Diana did an amazing job of being with both children and keeping spirits high as they had blood tests, IV drips and were later admitted for overnight observation. It is so encouraging to see the light and love of God reflected by our community members. Bella is suspected to have gastroenteritis and will stay in hospital tonight. Please pray for her speedy recovery and for mum to have peace at this time. Please pray for protection for our whole Shevet community against sickness. As we were in the echo room today Bella’s mum and I both became aware that our high expectations of the outcome of the appointment today might not be met. There was a bit of hesitation during the echo from the doctor and then some phone calls made to colleagues to discuss next steps. This of course was all in Hebrew so mum and I looked to each other trying to work out what exactly was going on. Bella has indication of stenosis. 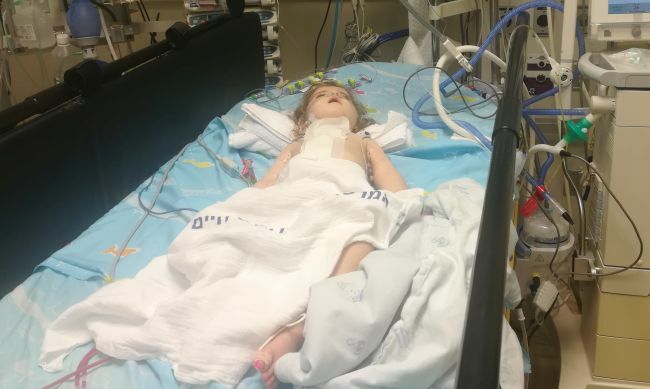 This is not particularly unexpected in Bella’s case and would not necessarily require immediate intervention if Bella lived in Israel. 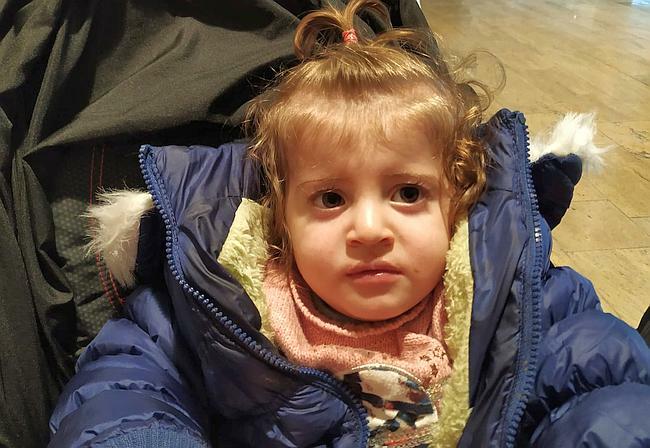 However, due to Bella hopefully returning to Kurdistan soon the medical team want to make sure that they have done all they can to help her heart as she will not be able to access the level care at home. 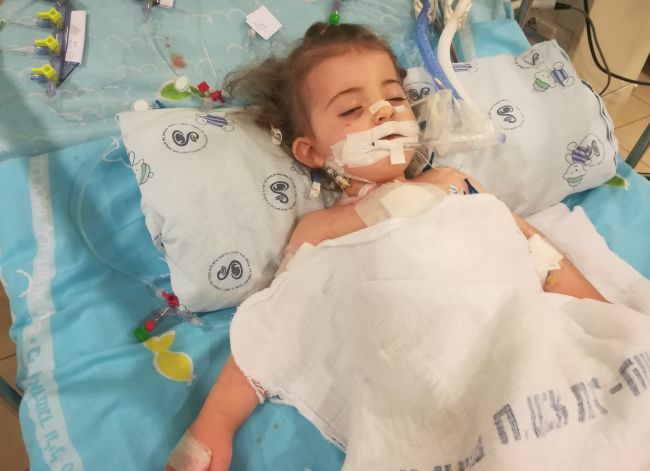 Bella will now need to wait for a CT scan of her heart and may require catheterisation or a surgery prior to being discharged from hospital. Please pray for mum today as she i s naturally very sad and disappointed. Please pray for Bella’s complete healing. Today early in the morning we took our pretty Bella and her lovely mother for a follow-up appointment with her neurologist. After surgery she had seizures and for that reason she is taking medication. When we entered the exam room she cried a lot but with music and games she calmed down. The doctor was very pleased with her progress. She has not had anymore seizures. Also, she can eat, play and walk without any problems, and her cranial nerve examination was good. She will need a follow-up again in Kurdistan. Also the medicine for her brain will be decreased and in one week stopped. Mom was very happy that everything is going well with her. Tomorrow she will have her second echo. Please pray for that, for good results so they can go home this week. 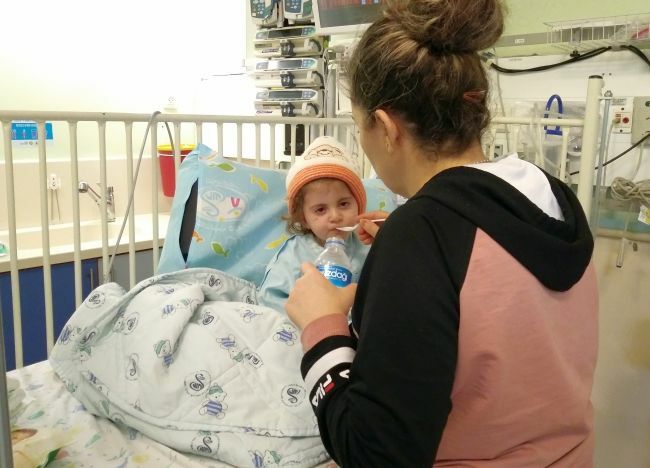 We were happy to collect Bella and her happy mum from the hospital today. Her mum is always so positive and today she was particularly pleased to point out Bella’s movements and use of her right arm and leg. She said how she is so happy for Bella to be finally doing so well. The anticipation for this moment is so huge. Bella was sleepy and compliant with coming home in the car, and it was lovely to be able to deliver her home. We are hoping and praying that Bella will make a good recovery at home, for her heart, and also in her brain. Thank you Jesus for bringing her this far and showing her your healing power. When I arrived at Bella’s “room” today she was actually eating something which is very encouraging. Then she had a few teaspoons-ful of water. Mum stood her up onto her feet and she held onto the end of the bed and stood there for a while. Then she settled down to sleep with some milk in a bottle. The nurse said there’s no improvement in her side which is slightly weak, but mum can see an improvement and doctor confirmed that CT scan was fine. Mum has been massaging her. Mum was her usual positive self and optimistic about things. 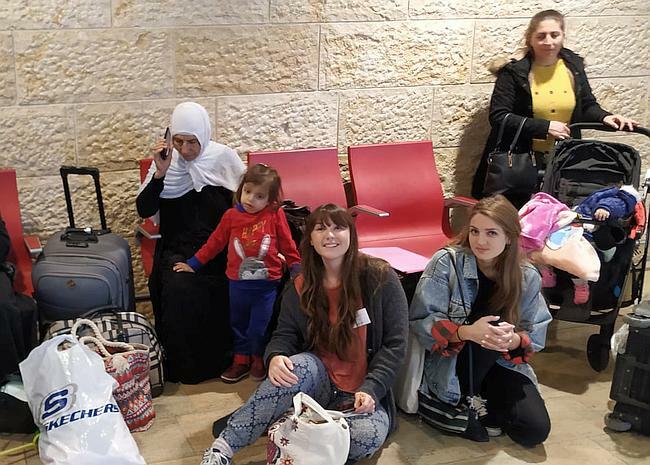 Please pray for Bella’s continued improvement and for mum to come closer to Jesus through this experience and her contact with the Shevet community. Lovely Bella is intubated and sleepy in the ICU. She had a difficult weekend, and had to have a catheterisation to address some difficulties with breathing. Today, it was so nice to see her mum. She is such a calm and pleasant person and really good fun to be around. Thank God, the report for Bella was good, and the next step is waiting to extubate her. Please pray that she continues to improve. 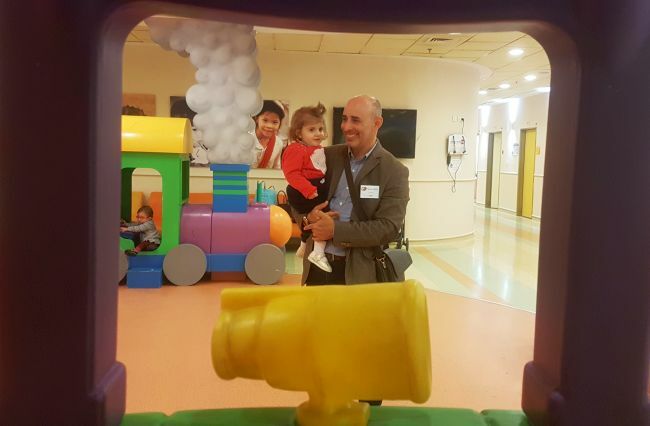 When I went to greet Bella’s mother she seemed so full of peace, faith and assurance that everything was going to be fine, she was very happy that the moment she had been waiting for had finally arrived : her princess was having surgery!. It was a long wait approximately 7 hours, we were in the waiting room with her mom all the time, she showed us some pictures of her family, we were also talking with her family by phone and video call, we prayed together for wisdom for the medical team but we also prayed to thank God. Two of the doctors came out and told us that the surgery had been a success and that they had fixed everything that was in the wrong place, also, before she came out of surgery, they made an echo in which it indicated that everything was as expected, however for now , the most important thing is her recovery for the next 24 hours, she is stable and possibly be extubated tomorrow. Please continue to pray for this beautiful princess, that everything goes smoothly and she can return home soon with her lovely mother. Finally we got the phone call that Bella could come to hospital for her surgery. Her mum waited so long for this day and was really happy to get this news. During the drive Bella was really cute and happy, having no idea that she would go in for surgery. She even started to babble and talk! It took us some time until they got Bellas bed ready, but the mum was really patient and we had a good time together. Please pray for the surgery that she will have tomorrow that the surgeons will have wisdom, that it won’t be too hard for the mother and that Bella will recover well afterwards. 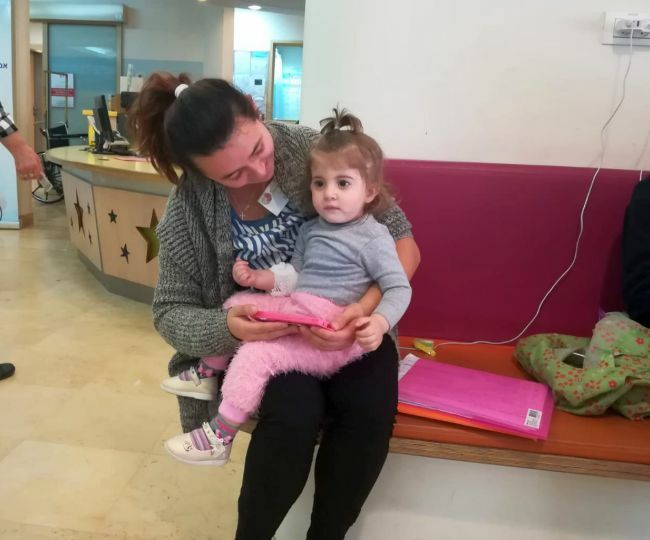 After spending Shabbat in hospital after her catheterisation on Thursday, little Bella was very alert and ready to go back to the Jaffa house. All dressed up and ready for the outside cold air, she looked adorable. 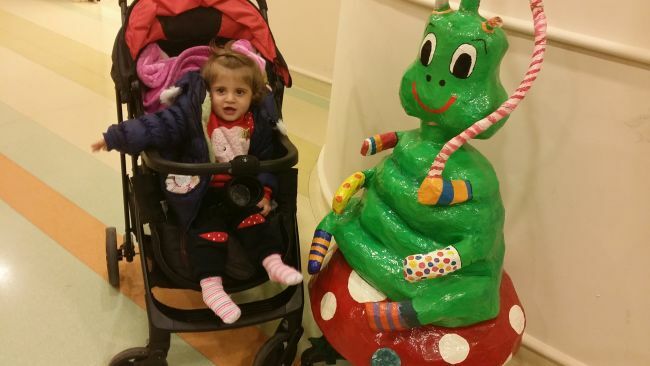 We had to wait a short time for one of our other children to be admitted but Bella was cheerfully distracting herself with the odd statues around the waiting room. Her mother is in good spirits and looking forward to a good night sleep. Bella will now wait at home for the medical team to formulate a plan for her surgery. Please pray this will be quick and effective. Today, Bella had her catheterisation already early in the morning. Her mum and I were waiting and praying that it would go well. 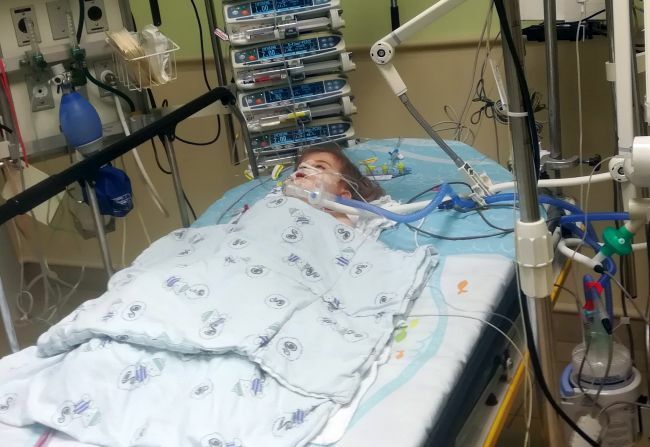 Her catheterisation finished quite quickly and they put her in secondary ICU. When we first saw her, she was still very sleepy and didn’t move a lot. But after some time, she started to move and to cry a lot, because she didn’t like all the cables around her. We could only calm her with playing a video of her mum’s phone. 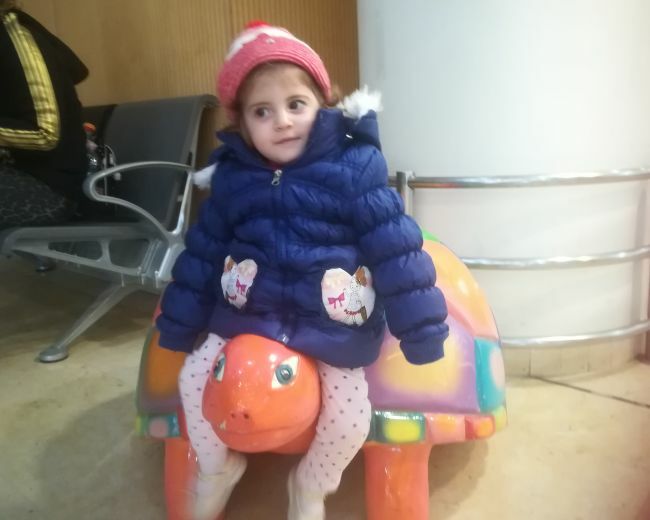 Sweet little Bella and her mum arrived today, and it was a pleasure to meet them at the airport, and then go to the hospital together. 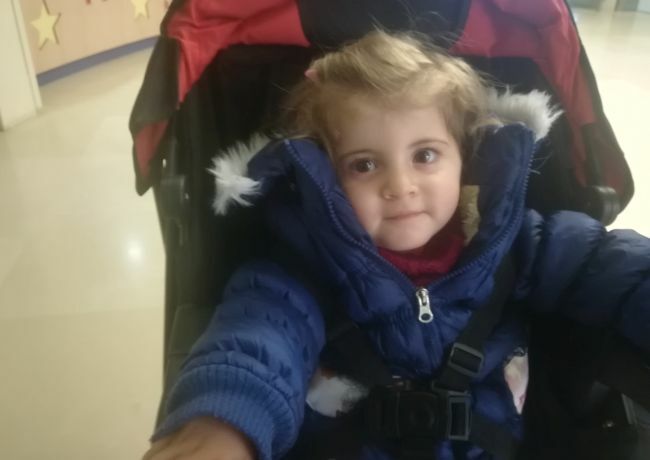 Bella seemed content throughout the day, and her mum was able to call her family back home and let them know that they had arrived safely. 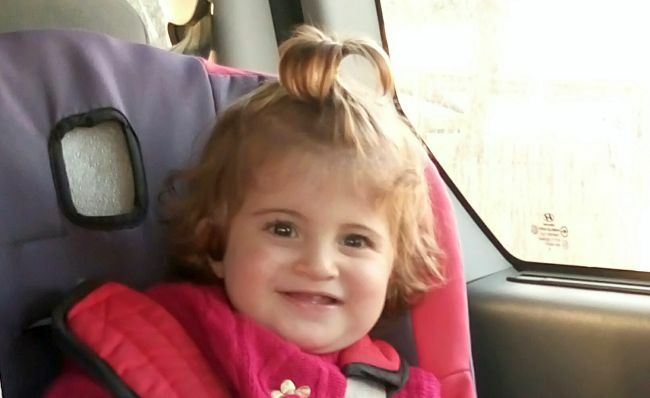 Bella needs to have a CT scan to help the doctors decide a plan for her surgery. For now, she is back at home with us. Please pray that they will settle in with us, and we will be able to be a blessing to them. 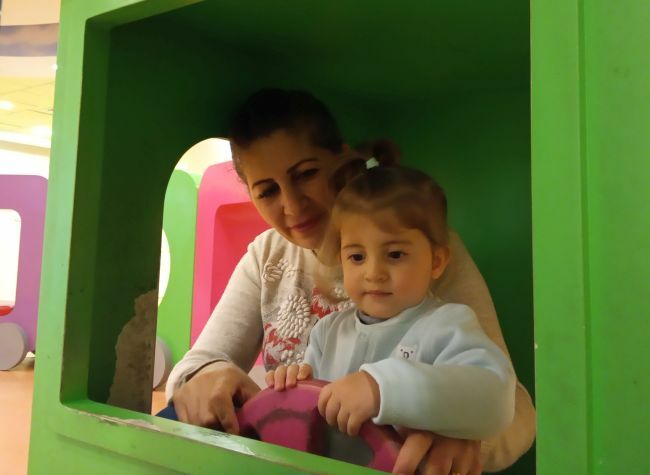 Bella and her family are from the ancient Assyrian people in northern Iraq, the same ones to whom Jonah made his reluctant missionary journey. The Assyrians were among the first people to converted to Christianity en masse in the first to third centuries AD and have lived separated in their own communities ever since. 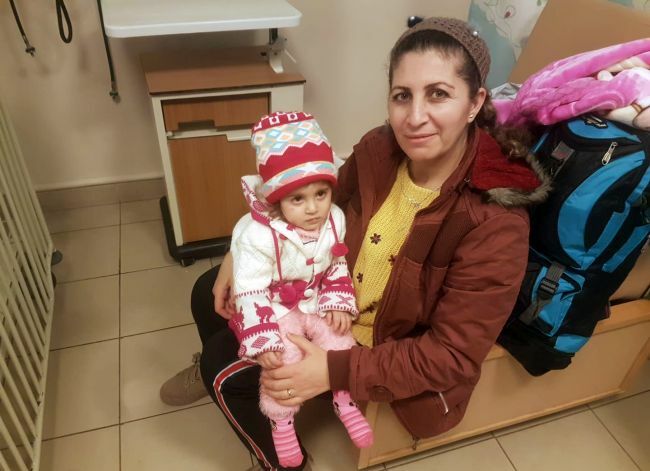 In the summer of 2014 the Islamic State swept into their city, and the family fled to Kurdistan for shelter. 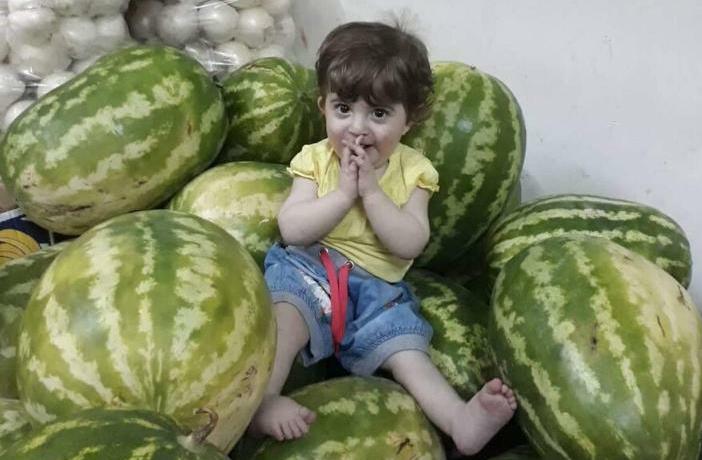 Bella’s father supports the family by selling fruits and vegetables from a makeshift stand on a street corner. 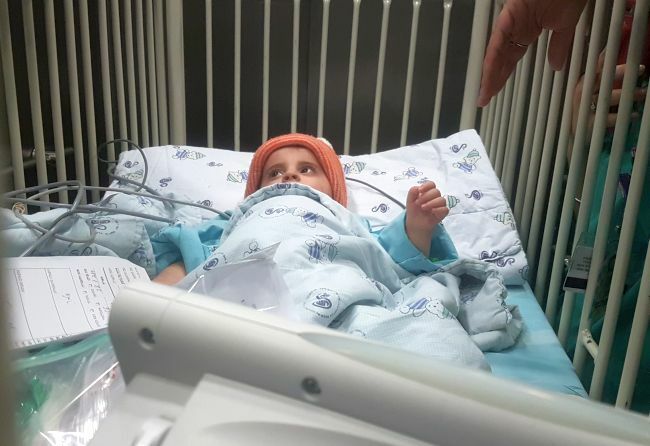 He reports that Bella is getting bluer and bluer, and with tears says he is hoping and praying that she will be able to travel soon for her heart surgery in Israel. As of right now, Bella still needs $8128 toward surgery and related expenses.